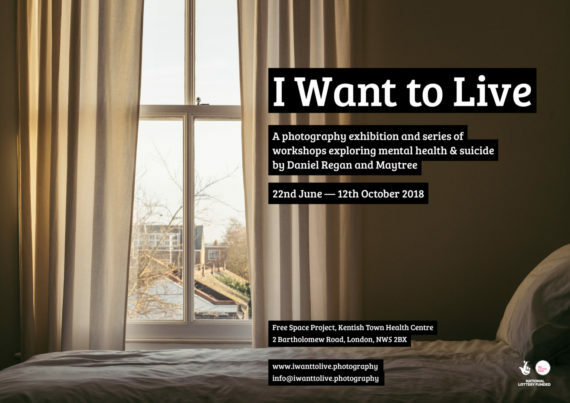 I Want to Live is a project run by photographer Daniel Regan and suicide respite centre Maytree. Maytree is a unique charity providing befriending support for people experiencing suicidal thoughts and feelings in a non-clinical and unique house based in Finsbury Park, north London. The project is spearheaded by Daniel Regan, a suicide survivor and photographer specialising in health, wellbeing and complex emotional experiences. The project comprises a number of interviews and photographic portraits of Maytree’s extensive volunteer workforce, investigating what brings people to volunteer with those in suicidal crisis, volunteers’ own mental health experiences and the impact of suicide. Alongside these images area series of photographs taken at the house highlighting the liminal space where significant changeoften takes place and the traces that Maytree’s many guests have left behind. The photographs and interviews will form part of a 4 month exhibition at the Free Space Project, an arts and health charity and gallery based in Camden, during which Daniel will be running a number of arts workshops and events focusing on suicide, mental health and bereavement. The building is open to the public Monday — Friday, from 8.30am — 6.30pm. Exhibition is on 1st floor.